Excursiones y tours archivos | Atenas. Guía de viajes y turismo. Excursiones y tours en Atenas, Grecia. Gracias a nuestro socio Viator, podemos ofrecer todo tipo de excursiones y tours. En este caso, en la ciudad de Atenas y alrededores. Cabe la posibilidad de hacer recorridos por la capital helena; ver sitios más lejanos como los famosos templos de Meteora; o podemos visitar alguna de las muchas islas que pertenecen a Grecia. A powerful Athens Segway tour. Semi-private Historical and Contemporary Tour. A Tour to local insights and hidden treasures of Athens. The heart of the city, its monuments, its history, its past, stories old and new, legends and myths, Greeks of yesterday, Greeks of today, a magical Athens, the Athens hidden behind the sights. 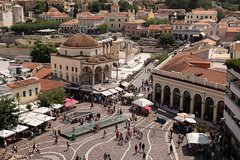 New Museum of Acropolis, Odeon of Herodes Atticus, The Acropolis, Areopagus, Ancient Agora, Hadrian’s Library, Roman Forum, Kerameikos, Tower of the Winds, Athens First University History Museum, Plaka, Monastiraki, Thissio, Dorides Telescope. HISTORY. A blaze of glory, a journey of existence. When it all began.A unique, historical semi-private tour experience. The heart of the city sets the pulse, followed by its monuments, its history, myths and legends, its stories old and new, its people, the Greeks of yesterday and tomorrow. Athens, the classical center of times gone by, of today and tomorrow. 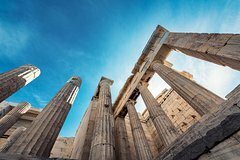 A three-hour semi private tour for six, led by an expert tour leader ready to share with you his in-depth knowledge, his insights and heartfelt authentic Greek hospitality. Discover Scuba Diving, Beginners’ Experience. Get an introduction to scuba diving during a 3.5-hour beginner’s lesson in Anavyssos. Get fitted for all the necessary gear at the local dive shop and listen to a 30-minute introductory lesson on diving theory on dry land. With your highly trained instructors, proceed to the sea for your first underwater experience. You will start at a minimum depth where you can stand out of the water. Once you’re comfortable, head out to a maximum of 5 meters depth. Accompanied by your instructors, submerge using your newfound skills and look for aquatic life. Small-Group Athens Sea Kayak Tour to the Temple of Poseidon. Prepare yourselves for the one and only sea kayaking experience that Athens has to offer! 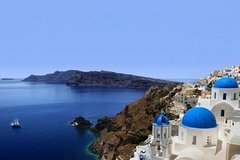 Admire stunning views from the seaside along the Athenian Riviera all the way to Cape Sounio and to the famous Temple of Poseidon! En route you will have the chance of having a light snack on one of the islets. Upon arrival to Cape Sounio, visit the famous temple and end your day with a marvelous meal, enjoying unique views and the sunset of the Saronic gulf. There is a maximum of 10 participants for this tour. Hiking Tour on the Ancient Delphi Footpath. 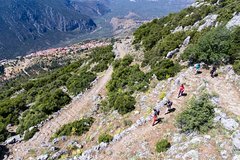 This is a historic and inspiring hike dropping down from the slopes of Mount Parnassus to the village of Delphi. Walk on the ancient footpath that took Pan’s worshipers up from the temples of Delphi to the Corycean Grotto to celebrate rites. Book your private arrival transfer from Athens Airport (ATH) to any Hotel or Address in Athens City or Athens coast today! The ROUND-TRIP transfer is included. Our driver will meet&greet you at the airport with a sign with the lead passenger name and take you to your car. We will then transfer you directly to your destination in Athens City. Benefit from our best offers today and book your arrival transfer from Athens Airport to Athens City. Athens Airport Arrival Transfer (Airport to Athens Hotels or Address). Book your private arrival transfer from Athens Airport (ATH) to any Hotel or Address in Athens City or Athens coast today! Athens Airport Departure Transfer (Athens Hotels to Athens Airport). Book your private departure transfer from any hotel or address in Athens City to Athens Airport (ATH) today! We pick you up at any hotel or address in Athens City in one of our Cars or Minivans and take you directly to Athens Airport. Benefit from our best offers today and book your departure transfer from Athens to Athens Airport. Wine Tasting Under Acropolis. 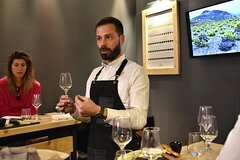 Taste Greek wines in the most unique way. Right under Acropolis. Take a virtual tour through wine regions of Greece. Taste the 5 basic Greek grapes paired with cheese, cold cuts and olives from all over Greece. Athens Meteora Monasteries Day Trip by Rail. 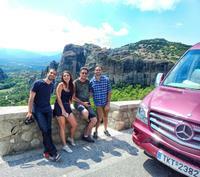 Visit Meteora from Athens for an amazing experience on this full day tour. Travel by train from Athens and see all 6 Monasteries on this Panoramic tour with a local guide. Relax in comfort aboard your VIP Mini Bus with WIFI as you take in the spectacular views. You’ll even have time to stop for pictures and enter several of the monasteries before your return to Athens.